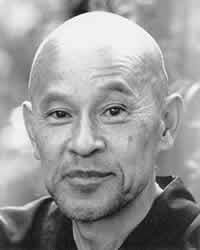 Comparing the chapter, Bowing, p.43, Zen Mind, Beginner's Mind, with sources in the lecture archive reveals that the first half of the chapter has no other clear source. The lecture titled Bowing, file name 65-12-02, in the archive is the source for the second half of the chapter. The first half in bold below will be entered into the archive as a separate entry maybe titled "Excerpt from the chapter Bowing in ZMBM". Yes - now it's there as 65-12-02-A. BO W I N G "
Bowing is a very serious practice. After zazen (sitting meditation) we bow to the floor nine times in front of Buddha's altar, each time touching the forehead to the floor three times and lifting the palms of the hands. heaven and earth, man and woman, teacher and disciple. we may bow to cats and dogs. same respect given to a Buddha. Here there is Buddhahood. So even though we forget all about it -- still we have Buddha Nature here, so Buddha bows to Buddha. That is bow. This is one meaning. you will possess everything within your big mind. master always called my teacher "You-lately-joined-fellow,"
I am like a cat!" He was very pleased to be like a cat. My teacher had hard skin on his forehead because he bowed and bowed and bowed so many times and he knew that he was very obstinate, stubborn fellow, so he bowed and bowed and bowed and he always heard his master’s scolding voice. That is why he bowed. And he joined our order when he was thirty. For Japanese priest to join the order at the age of thirty is not early. So his master always called him ‘You lately-joined fellow’. He said, [Japanese phrase missing in transcript]. It means priest who joined our order when he is old. When we join order when we are young we have little -- it is easy to get rid of our selfishness. But when we have very stubborn, selfish idea it is rather hard to get rid of it. So he was always scolded because he joined our order so late. To scold does not mean slight people, or it does not mean to -- actually his teacher was not actually scolding him. His master loved him very much because of his stubborn character. When he was seventy he said, “I -- when I was young I was like a tiger but now I am a cat.” He was very pleased to be a cat and to be like a cat. “Now I am cat”, he said. And to bow means to eliminate our self-centered idea. It is not so -- actually it is not so difficult -- easy -- and although it is difficult to try to get rid of it is very valuable practice. The result is not the point but effort to improve ourselves is valuable. There is no end in our practice. vow to attain it." If it is unattainable, how can we attain it? But we should! That is Buddhism. To think, "Because it is possible we will do it,'' is not Buddhism. your activity. Real calmness should be found in activity itself. We have four vows -- although sentient being is innumerable, we have to save -- we vow to save them (that is one). Although are evil desires is limitless, but we vow to get rid of it (that is second) and although the teaching is limitless, but we vow to study. Although Buddhism is unattainable, we should attain it. That is four vows. If it is unattainable, how can we attain it? But we should. That is Buddhism. Because it is possible we will do it. That is not Buddhism. Even though it is impossible we have to do it if it is our true nature. Whether it is possible or not is not the point. If we want to do it we have to do it even though it is impossible. So whether it is possible to get rid of our self-centered idea or not is not the point. Anyway we have to try to get rid of it. When we make this effort there are our appeasement, there our Nirvana. There is no other way to attain calmness of your mind than to do it -- than to try to do it. If you -- when you thinking about -- before you decide -- determine to do it you have difficulty but if you start to do it there is no difficulty -- there is appeasement, there is calmness of your mind. So calmness of your mind should be found in -- real calmness should be found in activity. Calmness of your mind does not mean to stop our activity. In our activity there is true calmness. So we say, ‘It is easy to have in inactivity, but it is hard to have calmness in our activity, but calmness in activity is true calmness. enough. There is no Nirvana outside our practice. As to progress -- we don’t know how much progress we made, actually, but if you practice it you will realize -- some day you will realize that our progress is not -- it is not possible to make rapid, extraordinary progress. Even though you try very hard, you cannot actually make progress. The progress you make is always little by little. It is like -- to go through fog. You don’t know when you get wet, but if you just walk through fog you will be wet, little by little, even though you don’t know -- it is not like a shower. When you go out when it is showering you will feel, ‘Oh, that’s terrible!”. It is not so bad but when you get wet by fog it is very difficult to dry yourself. This is how we make progress. So actually there is not need to worry about your progress. Just to do it is the way. It is, maybe, like to study language. Just repeating, you will master it. You cannot do it all of a sudden. This is how we practice, especially Soto way, is to do it little by little. To make progress little by little. Or we do not even mind, we do not expect to make progress, just to do it is our way. The point is to do it with sincerity in each moment. That is the point. There should not be Nirvana besides our practice.